By the way, there's a problem with the chosen image, its left side seems to be slightly clipped (1 pixel). I haven't played with the "Simple and Fast Multimedia Library" text very much, and I have a final exam tomorrow I need to study for today so I don't have much more time to test things. Once again, the font is Soft Geometry Pro (Bold N) from here. As for sub-text, I'm personally leaning towards #3, but with a bit smaller text with some more kerning between letters. Oh, the outline is gray with an HSV of (0, 0, 125) and a stroke width of 1px (with the given resolution of the SVG). For the final version, I would export a very high resolution version from Inkscape and then downsize it using another program, like Gimp or something. Exporting a low resolution one directly from Inkscape results in some poor sampling. Agreed Unfortunately I don't have time today to play with other variants (or positions). I will have plenty of time tomorrow though. That looks nice. What font is it? I'm not stressed, releasing it today was the initial plan. I think we have the final logo, so I can use it. Details such as adding "simple and fast multimedia library" can be done later. It's just a different variant of the logo. I misread then, I though you said it would be relased next week. Next week after yesterday, which was sunday, so it's now this week. Hey, just wanted to say congrats on getting this out. It's a great project that I've made good use of. Sorry if I missed it, is a Photoshop project file available for the logo? It would be good to have to build logos for bindings. I suppose that the font is public domain or open source, too? By the way, the website could use that pentagon as a favicon. I would very much like the original files so that a nice binding logo can be made. The logo sources will of course be available soon. First, I just want to give a HUGE thanks to everyone in this thread! Whether you contributed ideas and feedback to the logos I worked on, or submitted your own logos, or commented and contributed to other logos, it all was incredibly important and beneficial to the evolution of ideas and I don't think we'd be where we are without everyone's contributions. Ya'll are awesome. I posted a large PNG version and the actual SVG. It was made in Inkscape. It looks like Laurent tweaked the sizings of things a little. @Laurent: if there are any modifications or tweakings you'd like, let me know! I'm all done with school now so I have plenty of time! 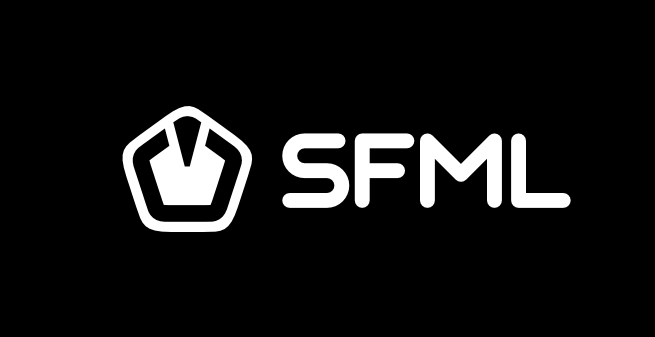 Also Laurent, if you don't mind, I'd like the SFML logo to be public domain (or if you think that's too broad, suggest an alternative; I don't really care too much about the license). Yeah I'd like to know about this. For example, can I modify it etc to fit the splash screen of my game? Also congrats to everyone for the final logo, its very nice! I'm really happy with how everything turned out. That wedge idea really gave the logo a defining look and made it unique. @eigenbom I really like the black on white.